Some thoughts on the Semicha "scandal"
See the Jewish Week, and then the Forward... Also the actual letter at the Jewish Channel. Some thoughts, now that it is over and resolved. I looked it up in the dictionary, and surprisingly, "scandal" was not defined as "someone's principled decision that I happen to disagree with". Yes, some people used "Semicha Scandal" to describe it. But even without using such words, I think that this is how this was framed in the news articles, etc., covering the story. 2) When trying to set legal precedent, it is common to find the most appealing, heart-wrenching case. And I am sorry that Shalom's wife had been ill. But that doesn't make it "Your Semicha Or Your Wife". The RIETS student in question, who asked to remain anonymous at this point, told The Jewish Week that his intention had been to have a one-time partnership minyan in his home so that his wife, who had been ill, could be called to the Torah and recite a blessing of gratitude after her recovery. I may be reading it wrong, but it seems like he was working on the assumption that she could only say birchas hagomel if she herself was called to the Torah for an aliyah. Meanwhile, in my local shul, a woman said hagomel without receiving an aliyah. And if she was not yet healthy enough to attend shul, or his local shul did not allow women to make this blessing, he could have had a normal minyan in his house, rather than a partnership minyan. Did he not know this? Was he looking for a pretext? Or was the being called to the Torah also an important aspect of what she wished to do? In the meantime, the rabbinic student in question said that while his intent had been to host the partnership minyan just once, at the request of his wife, he is now is unwelcome in his community’s Orthodox synagogue, and he has held subsequent services in his home. Compounding the situation: “The people who came like it,” he said. In the comment section, some "Anonymous coward" claims to be from his community and says he is indeed welcome in the shul. I don't know that we can trust Anonymous about this. But then again, the entire article is populated with anonymous sources. That "the people who came like it" should not "compound the situation". A leader does not follow the crowd's desire. 3) I wonder if this letter was leaked as a means to apply pressure to YU to cave. I hope not. They were already in discussion with him. 4) RIETS has a right to insist, if they are honestly professing their belief and imprimatur, that a student is מהתלתים שהגיעו להוראה, that the student will work within a certain framework of halacha. Rabbi Josh Yuter, who received ordination from Y.U. in 2003 and now serves as the rabbi of Manhattan’s Stanton Street Synagogue, took issue with the assumptions underlying Penner’s letter, particularly that Y.U.-ordained rabbis do not have the authority to make Jewish legal decisions and are instead expected to defer to more recognized arbiters. “That’s not what semikha is,” Yuter told the Forward by phone. “That actually contradicts what it says on the semikha certificate.” He explained that the certificate’s wording makes clear that he has the authority to render decisions about what is forbidden and what is permitted according to Jewish law. Ordination is a “stamp of approval” through which an institution asserts that its graduates represent the principles of its Yeshiva. The language written upon the klaf of each musmakh – “Yoreh Yoreh” does not imply unlimited permission to guide others in matters of Jewish law; it assumes that the musmakh will provide such hora’ah in keeping with the principles of the granting institution. Semikha is a “leaning upon” – a transfer of authority for Jewish law passed from one generation to the next, conferred upon the graduates of RIETS as they take their place in the Jewish community. There were a number of assertions in the letter, so read the whole thing. I want to expand on some of the points. A) When some rabbinical students receive semicha, even though the klaf says they were הגיעו להוראה, they weren't really. I think that this is true, not just about Y.U. ordained rabbis but about rabbis in general, from a swath of other institutions, on both the right and the left. The text of semicha is fixed, but that doesn't mean that it is literally true in every case. What do you call a rabbinical student who scored a 65 on all his semicha bechinos? "Rabbi." Sometimes it is just time for a student to move on. Sometimes they will have a fulfilling career as an elementary school rebbe, or a high-school administrator, and they need and should receive the degree. And this is what the klaf happens to say. But they have no business paskening, despite what the klaf says. B) There is a time and place to recognize when you are out of your element, and such humility is critical. So for relatively "minor" matters within the accredited fields, sure, you have the ability and granted authority to pasken. But not necessarily for the really big issues. I will present a source or two which appears to demonstrate this idea, along the lines of וְשָׁפְטוּ אֶת-הָעָם, בְּכָל-עֵת: אֶת-הַדָּבָר הַקָּשֶׁה יְבִיאוּן אֶל-מֹשֶׁה, וְכָל-הַדָּבָר הַקָּטֹן יִשְׁפּוּטוּ הֵם. It was possible for members of a Bet Din (who had received real semicha, and were higiu lehoraah) to not know the matter of law. And so they would consult with a greater Bet Din, and then an even greater Bet Din, and then an even greater Bet Din. Because they had the humility and sense of responsibility to know that they are out of their element, and to consult with their rabo muvhak, or some other acknowledged expect, on the big questions. And that to act otherwise, even though they might have the certificate, would be rabbinic malpractice. Tanhum son of R. Ammi happened to be at Hatar, and in expounding the law to its inhabitants, taught them that they might soak the grain before grinding for Passover.10 But they said to him: Does not R. Mani of Tyre live here, and has it not been taught that a disciple should not give an halachic decision in the place where his teacher resides, unless there is a distance of three parasangs — the space occupied by the camp of Israel — between them? He answered: The point did not occur to me. R. Jacob b. Abba asked Abaye: Is it permitted to a disciple in a district under his Master's jurisdiction to give a ruling that was as authoritative as those contained in the Scroll of Fast-Days,33 which is a written and generally accepted document?34 — Thus, the other replied, said R. Joseph: Even on the question of the permissibility of eating an egg26 with kutha,27 which I28 have been asking him29 throughout the lifetime of R. Huna,30 R. Hisda gave me30 no decision. I would assume that these Amoraim were higiu lehoraah, and yet they did not decide matters of halacha -- even minor matters, it seems, within their rebbe's lifetime, when in the same vicinity. It was assumed that they would consult with and indeed defer to their teachers. [Sura and Pumpedita]-ordained rabbis do not have the authority to make Jewish legal decisions and are instead expected to defer to more recognized arbiters. Presumably, Rabbi Yuter has a valid response and competing system of halacha, and an explanation of how this present-day situation is different. And also how deferring that these Amoraim did towards their teachers is not symptomatic of a "vertically-organized, pagan society", to cite one prominent Hakham. But my point is that there is surely room for others (such as perhaps some roshei yeshiva in RIETS) to legitimately disagree, and there are plenty of Talmudic sources to lend their position credence. And the Forward and their readership are not interested in, or capable of, providing such a nuanced picture. As such, giving them ammo to criticize YU is not something I would advise. Rabbi Solomon Drillman: What's the Difference Between Mikdash and Mishkan? Rabbi Michael Rosensweig: Do students originate anything? Rabbi Avi Schneider: Architect or Prophet? But this list can be potentially pretty useless since unlike common words like אמר and שמר, these are uncommonly used words in a very narrow domain (gemology). And since the meaning of words shifts over time, we cannot be sure we are speaking of the same item. For instance, many say that Biblical sappir is not sapphire rather lapis lazuli. So it is not surprising that there is further dispute about the identity of Sappir. According to the quote that follows, Rav Saadia Gaon identified it as crystal while Michlal Yofi, on the basis of a Midrash Eicha Rabbati identified it as diamond.
" נֹפֶךְ סַפִּיר -- And the Gaon explained that Sappir was white, and that it is what they called in foreign tongue kristal. I am not sure where the quote of Saadia Gaon ends and Michlal Yoffi begins. I don't know why the later version would have omitted it. (Assuming that the earlier versions are original and don't reflect someone's insertion.) Maybe in the interest of space, since the other two or three opinions, namely Saadia Gaon, the midrash, and Ibn Ezra, are ones found elsewhere? Why allude to the Churban specifically in Pekudei? ולמה משכן משכן שני פעמים? ולפיכך אמר, משכן שני פעמים. The Maharal of Prague (1520-1609), in his supercommentary of Rashi, Gur Aryeh, questions why, of all places, this midrash should be positioned here. Is there something unique to the count in parashat Pekudei that should prompt the Torah to repeat the word Mishkan, in order to allude to the two destructions? "And if you ask what relevance there is in writing this here, and why did it not write this in any parsha which preceded it. Yet this matter is wondrous in wisdom, and this is known from that which the tablets were shattered, because they were given with pomp, such that the evil eye ruled over them (Tanchuma Ki Tisa, 31). And because here is written אֵלֶּה פְקוּדֵי הַמִּשְׁכָּן, that the Mishkan was enumerated here, and because of this the evil eye ruled over it, for anything counted, the evil eye rules over it (Rashi above 30:12 [J: at the start of Ki Tisa, regarding taking a census of Israel]). And since there was a count to each item in the Mishkan, the evil eye ruled over it. And so too the Bet Hamikdash, every item in the Mikdash had a count, as is written explicitly [J: first Bet Hamikdash in I Melachim 6-7, second in Ezra 8], and anyplace there is a count the evil eye rules over it." This is an interesting idea, tying the midrash to the פקד of counting. Yet for some reason I don't find it persuasive. A concept like ayin hara being sholet and thus causing the destructions is something I would like to be more explicit in the midrash. And there is only two destructions mentioned, of the two Temples, not of the Mishkan, so the connection to the Mishkan being enumerated is somewhat more tenuous. I also find the question interesting. (1) Why would the Torah introduce this textual irregularity here, or all places. (2) Why does the midrash introduce this idea specifically here? I don't share the same assumptions as the Maharal when it comes to analyzing midrash, and so I would say that the textual irregularity of הַמִּשְׁכָּן מִשְׁכַּן is driven by some peshat concern, or is some natural human way of writing these particular grammatical constructions. And that once this irregularity was present, the midrashic author took advantage of it to introduce the idea. However, I do think that there is something unique to Pekudei that is prompting this idea. That is, הַמִּשְׁכָּן מִשְׁכַּן could have appeared anywhere. And the idea is, for the benefit of Klal Yisrael, the Mikdash serves as a mashkon, collateral. And it gets destroyed rather than Israel being destroyed. This seems like the lesser of two evils, in the grand scheme of things. The word פקד means many things. Visit, count, remember. ז בָּאוּ יְמֵי הַפְּקֻדָּה, בָּאוּ יְמֵי הַשִּׁלֻּם--יֵדְעוּ, יִשְׂרָאֵל; אֱוִיל הַנָּבִיא, מְשֻׁגָּע אִישׁ הָרוּחַ--עַל רֹב עֲו‍ֹנְךָ, וְרַבָּה מַשְׂטֵמָה. 7 The days of visitation are come, the days of recompense are come, Israel shall know it. The prophet is a fool, the man of the spirit is mad! For the multitude of thine iniquity, the enmity is great. A day of visitation is a day of destruction. And so this functions as the prime for the midrash, setting the tone for this particular interpretation and revocalization of mishkan. I've been looking for the midrash of the bloody earlobes, as described in this previous post. You know, that the wives refused to surrender their earrings for the evil purpose of the eigel; that the husbands then ripped the earrings off their wives' ears. In the prior post, I showed what Rashi and the standard Midrashim had: that Aharon had this as a delaying tactic because women and children are fond of jewelry and would be reluctant, for that reason, to part with it. And that in response, so as not to delay, the men offered their own earrings from their own (male) ears. Pirkei deRabbi Eliezer adds that the reluctance of the women stemmed from righteousness (rather than love of jewelry). And a large part of the midrash stems from the difference from Aharon's command to take the jewelry of the women, boys and girls, on the one hand, and the next pasuk which describes it as earring אֲשֶׁר בְּאָזְנֵיהֶם, which is the masculine. I suggested the phantom midrash got the idea from the shift from active verb to the passive וַיִּתְפָּרְקוּ . In a comment, AryehS pointed me to the Torah Shleimah, by Rav Menachem Kasher, who discusses this. I'll provide a translation here. 19] פָּרְקוּ נִזְמֵי הַזָּהָב אֲשֶׁר בְּאָזְנֵי נְשֵׁיכֶם בְּנֵיכֶם וּבְנֹתֵיכֶם -- he [Aharon] said perhaps the women will wish to spare their adornments and the adornments of their sons and daughters, and the matter will not come to fruiting before Moshe arrives. But this did not help at all, because it states [next pasuk] וַיִּתְפָּרְקוּ . That is, that the gave. I would say that this might mean that the women gave. Or else that it might mean, as in Rashi, that the men gave their own. From the language 'but this did not help at all', it is unclear whether they [the women] gave of their own accord or whether they [the women] gave against their will. And in Lekach Tov later on (35:22) [on the donations to the Mishkan]: וַיָּבֹאוּ הָאֲנָשִׁים, עַל-הַנָּשִׁים, what does this come to teach us? Since it was stated [regarding the donation to the golden calf] פָּרְקוּ נִזְמֵי הַזָּהָב אֲשֶׁר בְּאָזְנֵי נְשֵׁיכֶם בְּנֵיכֶם וּבְנֹתֵיכֶם וְהָבִיאוּ אֵלָי, Israel said, "By what will be atoned the sin of the removal of the golden earrings from our wives, sons and daughters, which we stripped them of their adornments to fashion golden gods. However, when Moshe gathered them to bring silver and gold for the work of the Mishkan, they brought all the adornments of their wives, sons and daughters, to take them by force." And likewise in Midrash Aggada, volume 1, Kapach 188. "Therefore the women merited not to perform melacha on Rosh Chodesh, for by the incident of the Eigel their adornments were taken from them against their will, as is the implication of what is written וַיִּתְפָּרְקוּ etc.. And meanwhile, in the construction of the Mishkan they rejoiced in its giving. Therefore Rosh Chodesh was given to them as a Yom Tov. And it seems to me that this is Rosh Chodesh Nissan, on which the Mishkan was erected, and along with that Rosh Chodesh they keep all the Rosh Chodeshs of the years. End quote." "It was the custom of Egypt that the women had rings in their ears (that is to say, not in their nose as in Bereishit 24:47, 'And I placed a ring in her nose'). And so is written about the Midianites (Shofetim 8:24 'for they have golden rings'). For they are Ishmaelites. אֲשֶׁר בְּאָזְנֵיהֶם, namely in the ears of the sons [Josh: males], daughters and wives who were mentioned above." And a third position appears in Rashi here, that the women as well removed from themselves..."
So it seems that we can source the "against their will" part in Midrash Aggadah, at least one Lekach Tov, and Daas Zekeinim. I don't know about Ibn Ezra. Moshe offered the incense? Or did Aharon? Who is "he"? Read the context. The most straightforward answer would be Moshe, since Moshe was mentioned as the actor in pasuk 17, and was the presumed actor in every pasuk, and every verb, that followed it. It would be very strange to introduce a new actor here. Unless we say that each of these, or even just the וַיַּקְטֵר עָלָיו, is al yedei shaliach. כז) ויקטר עליו : ברש"י כתב-יד שבידי: "אהרן שחרית וערבית"; וכן מצא גם הרמב"ן, ואמר "ולא ידעתי אם הוא טעות סופרים (כלומר אין טעות רש"י, כי אמנם אין ספק שהעבודה היתה במשה) וע' ספר הזכרון. "וַיַּקְטֵר עָלָיו -- in a manuscript of Rashi I possess: "Aharon morning and evening". And so found the Ramban, and said 'I don't know' if it is a scribal error (that is to say that it not an error on Rashi [the man]'s part, for regardless, there is no doubt that the service was done by Moshe). And see Sefer Hazikaron. Indeed, there is a curious interrupt between the Hebrew and English in the Judaica Press (at Chabad) translation above. The English does not specify Aharon as the actor, while the Hebrew does. This because they pull the Hebrew and English text of Rashi from two different sources, such that they often don't match up. which explicitly notes that Aharon performed certain sacrifices on this day, as well as that Moshe was offering these sacrifices (Mincha and Olah), to the exclusion of (perhaps) the preceding. In light of this, perhaps one can argue that Rashi considered (or the erring scribe considered) that the pasuk in Shemot 30:7, in context, to be a requirement for Aharon to light it even on the eighth day of the miluim. ה וְעָשִׂיתָ אֶת-הַבַּדִּים, עֲצֵי שִׁטִּים; וְצִפִּיתָ אֹתָם, זָהָב. 5 And thou shalt make the staves of acacia-wood, and overlay them with gold. ו וְנָתַתָּה אֹתוֹ לִפְנֵי הַפָּרֹכֶת, אֲשֶׁר עַל-אֲרֹן הָעֵדֻת--לִפְנֵי הַכַּפֹּרֶת, אֲשֶׁר עַל-הָעֵדֻת, אֲשֶׁר אִוָּעֵד לְךָ, שָׁמָּה. 6 And thou shalt put it before the veil that is by the ark of the testimony, before the ark-cover that is over the testimony, where I will meet with thee. ז וְהִקְטִיר עָלָיו אַהֲרֹן, קְטֹרֶת סַמִּים; בַּבֹּקֶר בַּבֹּקֶר, בְּהֵיטִיבוֹ אֶת-הַנֵּרֹת--יַקְטִירֶנָּה. 7 And Aaron shall burn thereon incense of sweet spices; every morning, when he dresseth the lamps, he shall burn it. because the instruction to burn incense was juxtaposed with the instruction to place the constructed altar in a specific place. Or alternatively, because it stated baboker baboker. However, I think that really Rashi was explaining the details: namely, just where there had been a command to Moshe about this vayakter, to justify the statement כַּאֲשֶׁר צִוָּה ה אֶת משֶׁה. That is, the commands of what to do appear earlier in this perek, in pasuk 4 and 5. And there in this perek, there is no command about the incense. However, Rashi is explaining that the offering of the incense is associated with the lighting of the lamp. And Moshe had been commanded in pasuk 4 to kindle the lamps. I have one Ktav Yad of Rashi from Rome, 1490, whi. Here are some interesting features of this. It interjects אהרן before the word ketores, not after it, as Shadal had it. This "ruins", or rather modifies the quote of the pasuk a bit. It cites two prooftexts, not just Shemot 30:7 for the morning, but Shemot 30:8, for the evening. There is no dibbur hamatchil for the next comment of Rashi. Whereas we should have ויעל עליו וגו from pasuk 29, this does not appear. And so it appears as if this a continuation of his comment on וַיַּקְטֵר עָלָיו. Entirely skips the first comment by Rashi regarding the miluim. 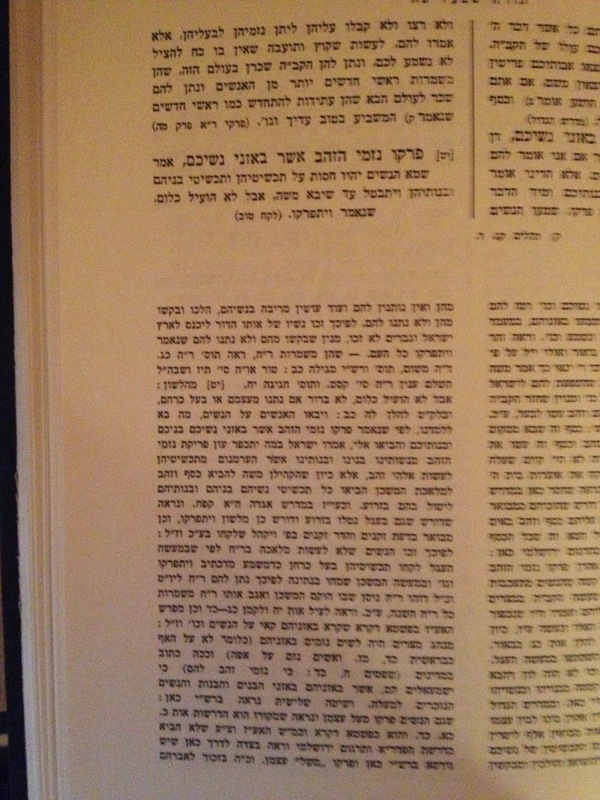 That is, the Rashi on pasuk 27 begins on the top line, ויקטר and ends on the third line, אהרן וגומר. On that third line, I underlined in red the dibbur hamatchil, את העולה. And so this manuscript entirely skips the dibbur hamatchil of וַיַּעַל עָלָיו, together with the assertion that certain acts were performed by Aharon on that eighth day, and instead it skips to the next, innocuous comment. If this is original, then maybe the interjection of Aharon and the next comment of Rashi go hand in hand. has Rashi's first comment on pasuk 29, though without a dibbur hamatchil. והנה משה רבנו בכל העבודות הכהן הראשון, ולפיכך הקטיר גם הקטרת. ואולי בכלל ונתת את מזבח הזהב לקטורת (פסוק ה): שתקטירנו עליו מיד. ומה שאמר בצואה (לעיל ל ו ז): ונתת אותו לפני הפרוכת והקטיר עליו אהרן קטורת סמים, להורות על ענינו מיום שהתחיל אהרן בכהונתו ולעולם, שכך אמר (שם ל ח): ובהעלות אהרן את הנרות בין הערבים, ואין הדבר אלא מיום זה ואילך, כי בכאן (בפסוק ד): ציוה למשה בפירוש והעלית את נרותיה. ויקטר עליו אהרן קטורת שחרית וערבית, כמה שנאמר (לעיל ל ז ח): בבקר בבקר בהטיבו את הנרות וגו', ובהעלות אהרן את הנרות בין הערבים וגו'. "He made the incense go up in smoke upon it: Moshe made the incense go up upon it all seven days of the miluim. And although it does not state in the commandment (in pasuk 5) "and cause incense to go up upon it", understand this from all the other services, for behold He commanded him here (in pasuk 4): that he should arrange the bread and kindle the lamps. And so too in "and he offered the olah and the mincha offering (pasuk 29), it was Moshe who offered it, for so was he commanded (earlier 29:38), "and this is what you shall make upon the altar", that he should start to do so in service before the miluim, for all the commands there (from pasuk 1 and on): are regarding the service of Moshe. And it states after this (in pasuk 42) "a continual olah for your generations", that the kohanim should do this for generations. And therefore it stated regarding it in the sidra of Pinchas (Bemidbar 28:6) "the continual olah which was made on Har Sinai", that Moshe began it there. And in the commentary of Rashi (in the pasuk before us) I have seen ... [then Ramban cites the Rashi with the interjected Aharon and both proof texts] ... And I do not know if it is a scribal error. Now, Shadal also instructed us to look at Sefer HaZikaron, by Rabbi Avraham ben Shlomo Bakrat. "ויעל עליו וגו': אף ביום השמיני וכו -- since there are several different nuschaot in the commentary of the Rav [Rashi] in these verses, I saw fit to record his language letter for letter. ויקטר עליו אהרן קטרת סמים: שחרית וערבית, כמו שנ' (שמות ל ז) בבקר בבקר בהיטיבו את הנרות וגו'. ובהעלות אהרן וגו'. But the Ramban za'l desired that the one who offered the incense was Moshe, and went on at length in his proofs, and wrote at the end of his words: "In the commentary of Rashi I have seen ויקטר עליו אהרן וכו'ש, and I don't know if it is a scribal error." End quote. , he [Rashi] says, "know ye that even on the seventh day, which is the day of the erection of the Mishkan, Moshe served in the public offerings, which were the olah, the mincha, and the tamid which are mentioned here. And if it is a scribal error as the Ramban za"l said, the Rav [Rashi] intended to say: it should not be difficult to you how Moshe offered incense and brought offerings after the seven, for even on the eighth day Moshe served for communal offerings, while Aharon only brought on that day his sin-offering and his burnt-offering, that is to say private offerings." End quote from Rabbi Avraham ben Shlomo Bakrat. Why does Rashi change Midrash Tanchuma? Preemptive atonement for the golden calf?